Lanique Rose Petal Vodka is made with Attar of Rose which is created by steam distilling thousands of rose petals. The base of Lanique is a spirit grain. Lanique is the brand name under which Lancut (pronounced 'Wan-tsut') Distillery in southeast Poland exports to the UK. The distillery was founded in 1784 by Princess Lubomirska and it is said that this is where Pierre Smirnoff learnt his trade. With this product, you earn 1400 loyalty point(s). Lanique is made with Attar of Rose which is created by steam distilling thousands of rose petals. The base of Lanique is a spirit grain. 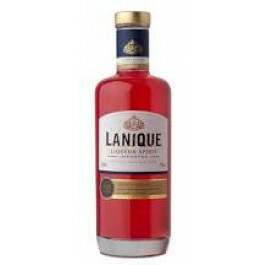 Lanique is the brand name under which Lancut (pronounced 'Wan-tsut') Distillery in southeast Poland exports to the UK. The distillery was founded in 1784 by Princess Lubomirska and it is said that this is where Pierre Smirnoff learnt his trade.